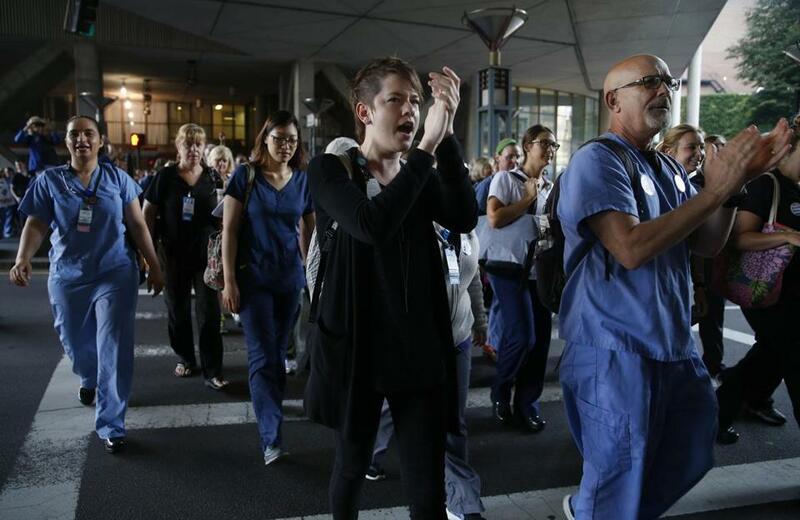 Nurses at Tufts Medical Center cheered as they headed back to work last year after a one day strike followed by a lockout. The dire analysis says the ballot measure would require Massachusetts hospitals to hire 5,911 nurses in a matter of weeks, costing $1.3 billion in the first year and over $900 million per year after that. The state’s largest nurses union, which is behind the ballot campaign for the November election, argues staffing regulations are necessary and rejected those figures as scare tactics. The analysis, to be released Monday, is the most detailed forecast yet on the potential costs of the proposal, and its projections are higher than what the Massachusetts Health & Hospital Association initially predicted. The association hired two research firms, Mass Insight Global Partnerships and BW Research Partnership, to complete the analysis. The report underscores the hospital industry’s concerns that the ballot question would be inordinately expensive and extremely difficult to comply with. Hospital executives say there’s already a shortage of qualified nurses in the state, so they don’t know how they would find thousands of new nurses to hire to comply with a voter mandate. Massachusetts hospitals are mostly free to staff their units as they see fit. The ballot question would change that by setting limits on the number of patients assigned to one nurse during a shift. The limits would vary from unit to unit, but for a typical medical or surgical patient, one nurse would be assigned no more than four patients, according to the proposal. The hospital industry-backed report contends passage of the plan would force Massachusetts hospitals to hire thousands of nurses in just 37 business days, a virtually impossible task. In addition to paying salaries to these nurses, hospitals would face higher recruitment, training, and turnover costs — and pay for wage inflation caused by increased demand for nurses, the report states. Hospitals argue these costs would trickle down to patients in their insurance premiums. Patients would also suffer because enormous costs could force some hospitals to shut down services, or close entirely, according to the report. Representatives of the nurses union slammed the report, saying it ignores important financial factors such as the profits hospitals now earn, the millions hospitals spend on building projects, and the millions of dollars wasted each year on avoidable readmissions and treatments. Philip Jordan, lead author of the analysis and vice president of BW Research, said the report was developed from staffing information provided by hospitals, as well as public data from the Bureau of Labor Statistics. The hospital association did not provide a breakdown of expected costs for each hospital in the state, as requested by the Globe. But it provided a few examples, including these: Cape Cod Hospital would have to spend more than $24 million to comply with the ballot question, MetroWest Medical Center would have to spend $15 million, and South Shore Hospital $33 million. Berkshire Medical Center would pay an estimated $20 million to hire new nurses. “This would place a significant financial burden on the medical center,” Berkshire spokesman Michael Leary said in an e-mail. The Massachusetts Nurses Association, a large labor union, has lobbied for decades to regulate nurse staffing, arguing that greater numbers of nurses will be able to provide safer care to patients. State legislators still could act on the issue, but union officials say they are determined this year to take the matter directly to voters — setting the stage for a bitter and expensive battle with hospitals until Election Day. Union officials said a new survey they commissioned shows that nurses are overburdened with too many patients at once, and patients are suffering. Ninety percent of nurses said they don’t have enough time to properly comfort and care for patients and families because of “unsafe” patient assignments, according to the survey results, and 77 percent reported medication errors because they had too many patients. “Things are really bad out there right now,” said David Schildmeier, a union spokesman. Of the 302 nurses surveyed — including nonunion nurses — 86 percent expressed support for setting patient limits through the ballot. Backers of the ballot question must collect another round of signatures before the measure can appear before voters in November. Opponents are challenging the union proposal in the state Supreme Judicial Court.